Safety is defined as the condition of being safe; freedom from danger, injury, or damage. That sounds about right. No one is interested in losing part of a finger or having a laceration on their face. With that thought in mind, let’s talk briefly about safety in the VWC. We have a Safety Committee headed by John Herega which meets regularly to discuss shop safety issues and to review accident reports. Through this effort we continue to make strides in improving the overall safety record of the club. The question is this: Do you want to follow safety guidelines and stay accident free or do you want to ignore the usual safety practices and chance what could be a serious accident. I think we all know what our answer would be. Do we have accidents? Absolutely! Most are preventable but some are truly accidents which could not be predicted. For instance when using a sled for thin pieces of wood on the double headed drum sander, no one ever thought of the fact that the back rail on the sled which holds the wood in place also gets sanded down as the piece goes through the sanding process, to the point where it no longer can hold the piece in place. So what happens? The piece is propelled back at a high rate of speed right at the person feeding the wood into the sander. A couple of people were hit with the flying wood and fortunately no one was seriously injured. That is an unforeseen accident. But what about those instances where the known safety procedures are simply ignored or maybe the adage “familiarity breeds contempt” comes into play. Take the case of improper use of the jointer. We had a recent case where an individual was not using the push sticks as prescribed for this piece of equipment. Using only his hands, the wood was pushed past the blades but not far enough to allow the safety gate to close and as the individual pulled the wood back, his fingers contacted the exposed blades. Needless to say the result was not pretty. If he had been using pusher sticks, the sticks would have contacted the blades, not his fingers. But beyond that it should be remembered that the use of pusher sticks is mandatory and that the wood should always be pushed through the blades until the safety gate has closed. Everyone is responsible for safety. 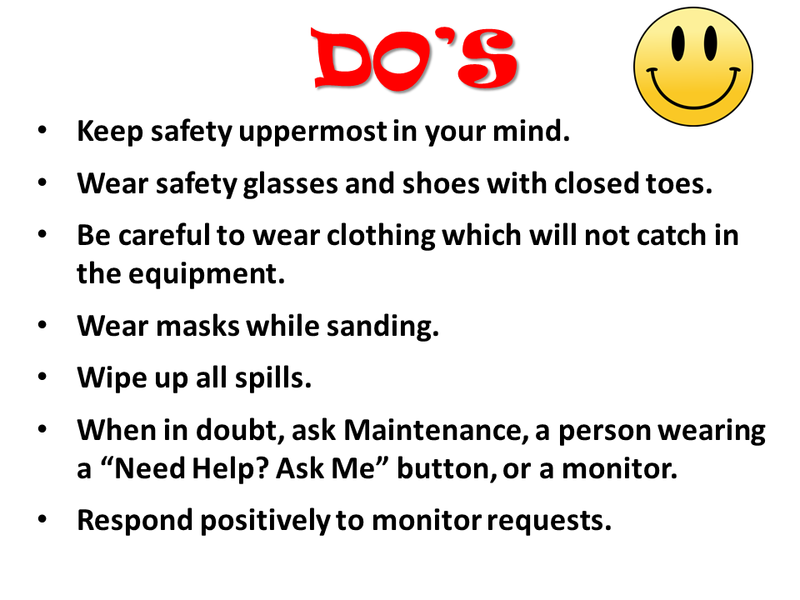 It begins by understanding the equipment you are using, the associated hazards of this equipment, and being knowledgeable about the safety precautions needed when working with this piece of equipment. And lest we forget, the second line of defense against unsafe working practices is the monitors who are on duty. Their responsibilities include addressing any unsafe practices they observe, up to and including taking that piece of equipment off line until safe practices are instituted. And last, any member of the VWC who observes an unsafe practice must bring the unsafe practice to the attention of a monitor or personally address the individual involved and explain the proper, safe operation of the equipment in question.